On 16th September this year we were lucky enough to be graced with music from the brilliant and well-loved band Take That. Gary Barlow, Mark Owen and Howard Donald flew to Jersey to perform a private set organised by Elaine & Chris Fairfax who bid for the gig at a charity auction for Children in Need, then re-donated their prize to raise money for Durrell’s Sumatran Orangutan haven project. 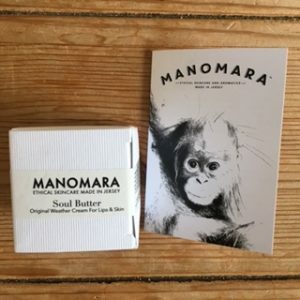 Manomara donated 50 gift bags and three went to particularly special guests:) They each received a jar of hand made Soul Butter and a Rainforest Candle made from eco soy and surplus local beeswax. The event was attended by Dr Tessa Hartmann CBE, Dr Lee Durrell & ITV local news anchor Jess Dunsdon.